The winter weather makes the idea of snuggling up and keeping warm seem pretty attractive right now. Whether you want to focus on “Hygge”, the Danish concept of enjoying your surroundings or just make your home feel cosy, it doesn’t take a major investment of time or money. After Christmas, we put away the decorations and things get back to “normal”. However, winter is a harsh season for most of us and it can be fun to add some tweaks to make the place feel a bit more inviting for cold evenings and snowy weather. Make the house smell great when you come in – warm scents like cinnamon or orange are good for evoking a sense of welcome at this time of year, so add pot pourri or a diffuser. 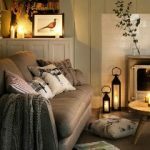 You have to feel warm – this can be hard to achieve if you have modern décor and large windows – the sight of wintery weather is only relaxing if you are toasty but if there is even the hint of a chill in the air then you’ll have the opposite reaction. However, adding softness and texture to a room means you can relax, so add some throws and textiles to create the visual reassurance of warmth. I like the idea of turning over traditional rugs so that in the winter you have the deep pile and the smoother surface in summer. Some people have different curtains for summer and winter. This is great if you have the enough storage. Lighting is key too. In Feng Shui, bright light is a popular choice for many situations but lighting needs to be suitable and harsh white light doesn’t make anyone feel like relaxing. Softer lighting that can reflect around the room is more effective so add lamps with mirrors rather than using ceiling lights. Warm colour schemes work best for cosying up – anything with the fire element in it such as orange, russet, and ochre work well. It could be that you can introduce these colours in the textiles, candles or even artwork on the walls.In traditional Feng Shui we work to make the energy of a space suit its time and purpose and anything that jars the senses affects the energy. So, while the concept is bigger than room layout and cushions, it provides a useful measure of how to get the best from your home in any season. I’m off to buy a few cushions now… Keep warm!